⁃ A pattern or arrangement of interlacing lines resembling a net. ⁃ Overall random pattern/network of cracks and/or fissures that may occur in the photographic emulsion/ binder/ coated layer. 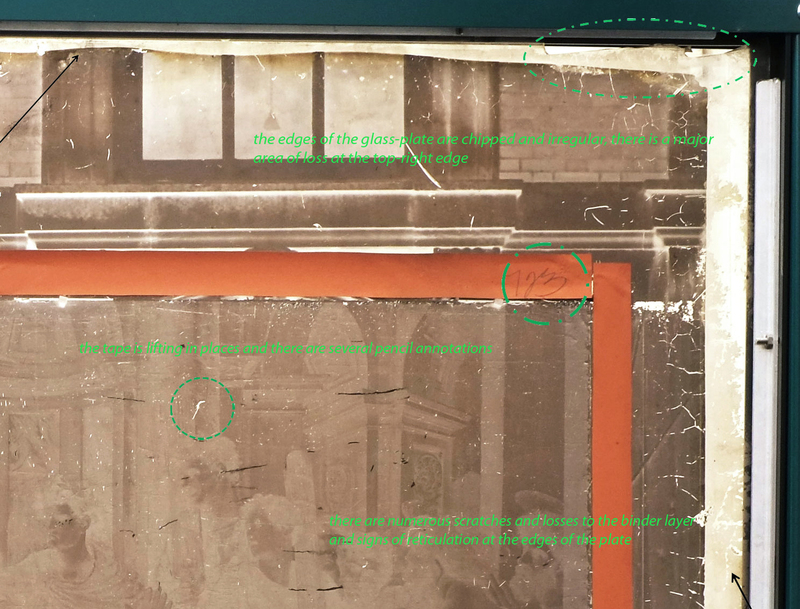 In 1865, Richard Redgrave, the Victoria and Albert Museum’s first curator, and the Science and Art Department’s Inspector General for Art, took up his pen to annotate a photograph. Redgrave’s inscriptions, inked across the albumen paper surface, mark in meticulous detail the object under study. In so doing, he created one of the first photo-based condition reports. Aside from being a fascinating example of early photography itself, it represents one of the earliest and most ambitious uses of the photograph in a museum, to document the condition of a work of art. It is testament to Redgrave’s groundbreaking work that the conventions he employed in his painstaking symptomatology – the use of large format photographs, a systematic lexicon, and key to describe material condition – are easily recognisable; many are still used today by museum conservators throughout the world. The entwining of museum, where I work as a conservator, and photography has long fascinated me; a preoccupation perhaps not unsurprising for someone responsible for the care of the museum’s photographs. Not only is the V&A home to the national collection of the art of photography, but it was also one of the first museums to have an in-house photographic studio. It was the new institution’s first director, Henry Cole, who set in motion the dual function of the photograph – both as a means of producing information, and as an object of high art – at the heart of his museum project. Redgrave, although keen to embrace the descriptive acuity of the photograph, particularly for documenting object condition, was less than happy with Cole’s insistence on the artistic merits of the new medium. Redgrave was in doubt. He was tasked, at the time of the proposed move of the Raphael Tapestry Cartoons from their home at Hampton Court Palace to the South Kensington museum, with assessing the condition and suitability of moving these fragile works of art. The commission to photograph the cartoons (detailed in correspondence held in the V&A’s archive) must surely have been a major undertaking for Henry Cole and his team. The main challenge was the lack of sufficient natural light in the gallery at Hampton Court Palace. The architect and inventor, Francis Fowke – another of the museum’s founding milieu – devised an ingenious solution. On days of fine weather the cartoons were lowered, by a team of Fowke’s sappers, through a gallery window into the court below, where they could be photographed. One of Fowke’s main contributions to the project was the design and manufacture of a camera of mammoth proportions, to fit a lens bought specifically for the task the previous year in Paris. Cole’s visionary conjunction was to persist. The instrumental use of the photograph was applied to a wide range of roles at the museum. Photographs were predominantly made of the objects in the collections for purposes of classification: as a pedagogical aid for distribution to schools of art, and for the commercial sale of prints to the public. Ever since those early days of the museum, and the advent of a revolutionary new medium, the materials and technology of the photograph have been worked into its fabric. The making of photographs, perhaps not unsurprising given the ubiquity of the image, remains essential to the functioning of the institution. Little has changed since Redgrave’s proto-conservation reports. Today’s condition report remains a curious amalgam of photograph and text. The latest incarnation (tablet based), continues to rely on the representative potential of the photograph, now digital of course. Recently I have been preparing one of Redgrave’s annotated prints of the cartoons for display. The images that I’ve taken are essential to that process. I can only wonder at how Redgrave would have felt knowing that his utilitarian report will soon be displayed in the V&A’s ‘A History of Photography’ gallery. His inked inscriptions have taken well to the albumen print surface. The symptoms and evidence of the cartoon’s past life are mapped in the photograph’s fine detail, and Redgrave’s descriptive lexicon. There is an inherent tension in the condition report’s conjunction of text and image. Everyone sees something different. However fascinating it is to witness this disparity between image and text, the written word, for the purposes of describing material condition, is currently deemed too subjective, compared to the representational qualities of the photographic image. The complex structure of the object under study is clearly visible: particularly the numerous paper layers and the vertical joints where the cartoons were cut into strips for the weavers. It’s easy to overlook that – although now considered some of the finest surviving examples of Renaissance art – the cartoons were also once perfunctory – integral to the process of making tapestries. Redgrave’s print is also showing signs of its past instrumental life. As such, it requires minor treatment, which includes surface cleaning and several small repairs, before it can be mounted for display. With so much of what I know of the photograph conditioned by working at the V&A, it’s hard not to be affected by this complex mixing-up of materials, practice(s) and place. Entangled, implicated along with others, I’m intrigued by the way in which the technical photograph mediates the space of interaction between objects. This reticular activity has, over time, coalesced into a complex net of relations between objects and the technologies of their capture. It is as if the museum, through this process of recursive activity, is largely conditioned by, and conditional on, the photograph. The museum would be unrecognisable without this process of technical inscription. The photograph, as no doubt you are aware, for a large part of its history was defined by the two stage negative/positive process. The making of photographs at the V&A, until the relatively recent digital incursion, has relied mainly on the genius of William Henry Fox-Talbot’s positive/negative process. As such, to be true to process, I should really have begun, not with Redgrave’s annotated prints, but the negatives from which they were made. In one of the V&A’s climate controlled stores are the twelve remaining wet collodion-on-glass-negatives, made in 1858 by Charles Thurston Thompson to document the Raphael Tapestry Cartoons. Richard Redgrave’s annotated prints were made from these negatives. On entering the storeroom there is a marked difference in temperature from the corridor, and the reassuring hum of the chiller unit. The nearest OCEAN (Object Centred Environmental Analysis Network) monitor suggests a temperature of 15.5 0c and a relative humidity of 31%. Photographs are complex chemical balancing acts, largely contingent on process and material stability. The preservation of these objects can be greatly extended by reduced temperature storage and the dark. Opening one of the drawers of the cabinet, one is immediately struck by the size and materiality of these early photographs. The twelve glass plates are a staggering metre square and a mere 10mm thick. This particular negative depicts the cartoon The Conversion of the Proconsul, Elymas Struck Blind. There are numerous fingerprints, scuff marks and accretions to the plate/emulsion surface. Even in the store’s relatively low-light conditions (without the illumination of transmitted light: so central to the negative) a faint image is visible in the light brown fug of the collodion emulsion – details of the artwork; an arrangement of figures: traces of the details of the cartoons complex construction; the cockled paper-layers. There are minor planar distortions and reticulation. The light-sensitive mutable skin (binder) has a granular structure, a plasticity that clumps and swells through the process of exposure and development. There are numerous (minor/major) losses and scratches to the emulsion. Many of the scratches have been retouched with black dye/ink. On closer inspection (using a torch to throw a raking light) : a micro landscape is discernible. The central area of the negative depicting the cartoon (the focus of Redgrave’s reports) is masked by tape. The tape is lifting in places and has pencil annotations, top-right. Telescoped in a territory of excess information – outside the taped-off sweet spot of the negative – a scenography is evoked: a work of art, a cartoon momentarily removed from the gallery, arranged outside, and secured on a platform support; a rolled cloth arranged on the grass below the object, and visible above the plane of the cartoon, are windows and the building of the Fountain Court. The edges of the glass-plates are chipped and cracked and there is a larger area of loss at the top-right corner. The transparency and stability of glass make it an ideal support for the photographic emulsion. This first conjunction of a glass substrate and binder was a major advance in the technology of the photograph – importantly reducing exposure times and producing a more detailed image. The untreated (beyond the emulsion) edges of the glass-plate are discoloured and dirty. There are numerous areas of staining. The size of the negative makes possible this movement across and through the image. In Towards a Philosophy of Photography (2000), the theorist Vilem Flusser describes this ambulatory movement as an ability to “wander over the surface of an image” – a radical, fundamental break with the linearity of the written word. Might this fissure shed light on the disparity – played out in the condition report’s antagonistic conjunction of image and text – between what can be seen and what can be said? But one is also drawn, from the image carried in the binder – a reversal of light and dark, transposed in the positive print – back to the three dimensional physicality of the object, and its singular complex material characteristics. Although now part of the V&A’s photography collection, this was once a working object and as such carries evidence of the wear and tear associated with having been instrumental. That the (art historical) status of these objects changed, is mainly due to happenstance. In the early 1990s, a flood in the photographer’s studio crypt store brought the attention of Elizabeth Martin, the then conservator of photographs at the V&A, who recognised the importance of these long-neglected objects. Although unconfirmed, it would be no surprise that Martin – who possessed a fine-tuned sensibility for her subject – was responsible for their discovery and rescue. The discovery precipitated their move from relative obscurity to a bespoke cabinet in the climate controlled environment of the collection stores: the technical photograph, hereby untethered from its functional role, and returned. With this shift in visibility comes a new lease of life: digitisation, through the latest photo-based technology, is being considered. My preliminary visit, to take the temperature of these objects, is detailed in my condition statement above. My doubts are not too dissimilar to Redgrave’s, and concern the stability and care of these fragile objects. It is perhaps unsurprising, considering their stature, that the cartoons, ever since the ground breaking work of Redgrave, Thompson and their milieu, have been the focus of several further scholarly undertakings: many of which were reliant on the photograph. One major research project in the 1990s deployed a heterogeneous range of investigative photo-technologies that included: x-ray, transmitted light, raking light, colour transparency and macrophotography. But it was the technique of photogrammetry (most often employed for aerial mapping of the spatial measurement of buildings) which made it possible to produce an accurate three-dimensional picture of the cartoon’s underlying paper layers. This extraordinary field of interactivity complicates the choice of an image to accompany this text. Is there one that catches this negentropic, circular play, of correspondence? I will settle with one of my annotated images of Thompson’s negative; the latest in a constellation of informational refrains, but almost certainly not the last. That objects remain elusive, always in flux – never fully relinquishing to modes of capture – is reassuring. However impossible to grasp, in this complicated field of activity, a heterotopian entity that I have come to know as museum-photograph, I’m drawn to speculate: what kind deluge would ensue if it were possible to summon, simultaneously, in one single phantasmagorical event, every moment of light-sensitive photographic inscription at the museum? Simon Fleury is a senior conservator at the V&A, responsible for the care of the Museum’s photographs. One of Richard Redgrave’s annotated prints can currently be found in the V&A’s History of Photography gallery. (Charles Thurston Thompson (1816-68) Raphael Cartoon with Condition Report Annotations, about 1858, no.76: 598). Posted on October 4, 2014 February 22, 2015 by vsmallfires	This entry was tagged Charles Thurston Thompson, condition report, Henry Cole, Richard Redgrave, Simon Fleury, V&A. Bookmark the permalink.